Your first apartment after college is a big deal because if you’re like most people, you moved straight from your parents’ home into a college dorm with at least one roommate. So this is the first opportunity to have a living space that wholly reflects who you are. Personalize your first post-grad pad with some guidance from CG. Think about the environment that you’d like to create. Do you want color everywhere, or would you rather go for an all white motif? Hardwood floors or a throw rug? Pictures on the wall or on the side tables? Remember, there are no rules. This is your place and you should make it whatever you want. Everything I came to college with, from my bed linens to my bath accessories, was pink. It was like Barbie’s dorm room. There’s nothing wrong with a feminine touch, but now might be the time to pass on your Hello Kitty alarm clock to your little cousin. You’re officially an adult, and you want your apartment to reflect that. Now, don’t think that you have to toss everything away. If you’re a pink and floral kind of girl, then stay true to yourself. But your apartment should have some balance. Hold onto your favorite bright pieces and use them as an accent or splash of color to liven up the more neutral ones. 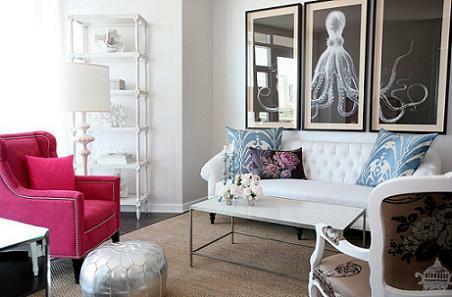 For example, a white couch plus hot pink throw pillows equals delicious décor! Consider transferring a few objects from your childhood home to your new place. It might be something sentimental like a family portrait or something a little more symbolic like painting your kitchen a similar color to your mom’s. Ask your parents if you they can lend you a piece or two. (Personally, there’s a painting hanging on my parents’ living room wall that I can’t wait to get my hands on.) It might take some time for you to get fully acquainted to your new place and really consider it a home. These items will speed up that process, making your surroundings more familiar while keeping you connected to some of the things you saw every day growing up. Additionally, I’m sure it will make your parents happy to know that you want to keep a piece of them close to you. It’s important to know how to determine when it’s wise to invest in a more expensive item and when it’s simply not worth the money. I’ve always believed that if you’re going to spend a lot of money on one thing in your home, it should be your bed linens. After all, you need good sleep to function and you need soft sheets to sleep well. If you’re in the kitchen a lot, invest in some quality cookware appliances. I wouldn’t recommend skimping on general household items like paper towels and toilet paper. You’ll need these things each and every day, and some things are just worth the extra three bucks. However, with cleaning supplies like glass or wood cleaner, the store brand is typically just as effective. If you know you prefer Windex or Pledge over generic though, go for it. (But don’t forget to coupon for these!) Try to be frugal on pieces that you know will have to be replaced eventually. For example, the welcome mat outside your front door will wear and have to be replaced. Same goes for your shower curtain and kitchen towels. Pinching pennies on certain items will allow you to splurge on other ones. So when you’re in the Target home décor aisle, try not to get too excited, so that you can determine which items should go in your “save” cart and which in your “splurge” cart. Remember, this is the place that you’ll be coming home to every night. You want it to be your safe haven, relaxation zone and general happy place. Less-than-stellar paychecks from most entry-level positions may not add up to marble countertops and floor-to-ceiling windows, but you can still take the matter into your own hands. With a little sentimentality, penny-pinching and creativity, your first apartment will be fabulous, comfortable and homey.